This guide is designed to assist students enrolled in Psychology courses with locating Library resources for their research assignments. The guide is organized into steps that cover the basic research process: identifying a topic, locating relevant sources, and citing sources used to write the paper. For general research assistance other than Psychology, view the links listed under Research Tools. The online edition (2015) of the 5-volume academic reference book (also available in the library-Ref. BF 636 P86 2015). The set covers the core aspects of behaviorism, cognitive psychology, psychoanalytic psychology including diagnoses, disorders, treatments, tests, and notable people. Volume 5 contains eight appendixes: a Glossary, an annotated Bibliography, a Web Site Directory, a list of Organizations and Support, a Pharmaceutical List of generic and brand-name drugs grouped by their uses, a Biographical List of Psychologists, and a list of Notable Court Cases. Books and other Library materials can be searched using the Online Catalog. Books for Psychology are categorized under sections BF of the Library's collection. There are two categories of books in the Library: general and reference. General books can be checked out and are often used for more in-depth research. Reference books do not circulate but can be useful for acquiring an overview on a topic. Reference books are located on the upper floor of the Library and circulating books are in the "Stacks" on the lower floor. With some 5,500 entries, the second edition of the APA college dictionary of psychology continues to feature clear and authoritative definitions that provide basic coverage from across 90 sub-disciplines of psychology. Special emphasis is concentrated on the fields typically encountered in undergraduate studies, such as general, personality and social, lifespan developmental, abnormal, and cognitive psychology. Moreover, basic coverage of neuropsychology and of statistics and methodology have been enhanced for this edition. 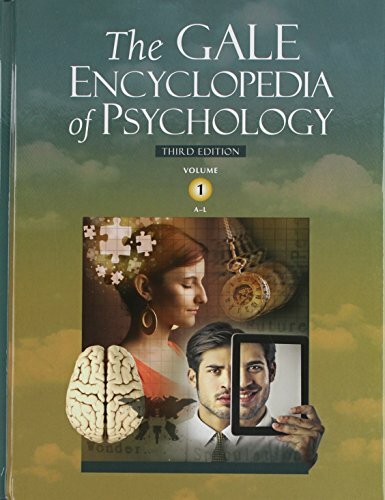 This second edition of a landmark reference resource - created not only for psychologists, clinicians, students, and professionals from allied mental health professions, but for all interested readers - offers definitive information on the lexicon of the field, including Almost 26,000 entries offering clear and authoritative definitions - approximately 1,000 more than the first edition Balanced coverage of 90 subareas, with significantly revised and expanded content especially in the areas of neuroscience, psychopharmacology, lifespan developmental psychology, statistics, experimental design, and many others. This comprehensive, four-volume reference set on the subject of criminal psychology includes contributions from top scholars and practitioners in the field, explaining new and emerging theory and research in the study of the criminal mind and criminal behavior. With over 11,000 entries, this comprehensive and up-to-date dictionary covers all branches of psychology. Clear, concise descriptions for each entry offer extensive coverage of key areas including cognition, sensation and perception, emotion and motivation, learning and skills, language, mental disorders, and research methods. The range of entries extends to related disciplines including psychoanalysis, psychiatry, the neurosciences, and statistics. Encyclopedia of Mental Health, Second Edition, tackles the subject of mental health, arguably one of the biggest issues facing modern society. The book presents a comprehensive overview of the many genetic, neurological, social, and psychological factors that affect mental health, also describing the impact of mental health on the individual and society, and illustrating the factors that aid positive mental health. The book contains 245 peer-reviewed articles written by more than 250 expert authors and provides essential material on assessment, theories of personality, specific disorders, therapies, forensic issues, ethics, and cross-cultural and sociological aspects. After more than a century of extraordinary growth and development, the science of psychology at last has a reference source that defines the study of mind and behavior. Here in eight superbly organized volumes is the definitive guide to every area of psychological theory, research, and practice. This book considers the complexities of human nature from a biological, psychological, and evolutionary standpoint and demonstrates how common modern behaviors can be traced back to early man. Provides a robust 800-entry survey of the field of psychology including notable people, theories, and terms, as well as landmark case studies and experiments. The Handbook of Child Psychology and Developmental Science , a four-volume reference, is the most comprehensive, authoritative text in the field. Provides comprehensive coverage of developmental science, including detailed explanations of major theories and methods. This cutting-edge guide spotlights some of the most exciting emerging discoveries, trends, and research areas in LGBT psychology, both in science and therapy. * Presents a concise history of LGBT psychology as well as coverage of current LGBT psychology in various subfields, including social, developmental, psychoanalytical, minority psychology, and women's psychology * Addresses issues in the LGBT community ranging from health disparities (physical, biological, and psychological illnesses that disproportionately affect the LGBT community) to addictions and substance abuse, stressors, and emerging policy issues. Serving as an indispensable resource for students and general-interest readers alike, this three-volume work provides a comprehensive view of mental health that covers both mental well-being and mental illness. This work is designed to provide a solid foundation for the research of various educational topics. This volume introduces the evolution of a variety of developmental theories and their application to the study of education. The essays discuss the current research regarding developmental stages, examine insights from the field of psychology on the learning process, and consider the development of the theories themselves over several decades. This newly updated set covers not only the history of the field and the core aspects of behaviorism, cognitive psychology, and psychoanalytic psychology but also diagnoses, disorders, treatments, tests, notable people, and issues. This encyclopedia traces theory and examines the beginnings of counseling and psychotherapy all the way to current trends and movements. Delving into a topic of perennial interest and concern, particularly among teenagers, this important volume addresses the full range of issues related to suicide and suggests ways to help those who struggle. Each Taking Sides issue is thoughtfully framed with Learning Outcomes, an Issue Summary, an Introduction, and an "Exploring the Issue" section featuring Critical Thinking and Reflection, Is There Common Ground?, Additional Resources, and Internet References. A scholarly journal (also referred to as academic journals, scientific journals, or peer reviewed journals) is a periodical that contains articles written by experts in a particular field of study. The articles are intended to be read by other experts or students of the field, and they are usually much more sophisticated and advanced than the articles found in general magazines. Many instructors assign research papers or projects that require students to read articles published in scholarly journals. This guide offers some tips to help distinguish scholarly journals from other periodicals. Includes more than 860 full-text newspapers (including the New York Times), providing more than 35 million full-text articles. In addition, the database features more than 857,000 television and radio news transcripts from CBS News, CNN, CNN International, NPR, etc. There are of course countless Web sites related to Psychology. Some recommended links are listed below. APA is the leading scientific and professional organization representing psychology in the United States, with more than 117,500 researchers, educators, clinicians, consultants and students as its members. Browse by Publication Type or Subject. Full-Text Articles can be found by Publication Type-Databases-APA PsycNET-Advanced Search-Only Show Content Where-Full Text. At Learn Psychology, it is our goal to engage and inform by providing well-written, in-depth information, resources, and data for those interested in pursuing a degree in psychology and other mental health professions. The Library maintains a collection of instructor reserve materials. These consist of textbooks, videos, and supplemental course materials that instructors have put in the Library for student use. To find what materials are available for Psychology, search Course Reserves in the Online Catalog. It is best to search by "Course Number" (ex. PSYC 101) in that an instructor other than yours may have placed an item on reserve. Materials can be requested at the Periodicals counter and generally must be used in the Library on a two-hour loan period. Photocopy machines are available for 10¢ a copy. The most common way to cite sources is to use a bibliography or a "References" list at the end of your paper. The references list includes a citation for each of the sources you used to write your paper. The citations are formatted in a consistent style according to one of several standard citation formats. The most common citation format for psychology research papers is The APA Publication Manual (American Psychological Association). The APA Manual (BF76.7 .P83 2010) is available in the Library stacks and in the reference collection. An abbreviated version of is also available on the Library's website under "Research Tools" - APA. The abbreviated version contains examples for citing full-text articles from online databases and other selected sources. If you are unsure about when and why it is necessary to cite sources, see "Understanding Plagiarism" for a concise overview. Assistance with writing your paper is available at the VVC Writing Center. Always check with your instructor for the required citation format.